November 1984 the first Cayman Aggressor steamed into Georgetown Harbor, Cayman Islands. It was a moment that carried the realization of Captain Wayne Hasson's dream: he had just pioneered the first luxury liveaboard concept. Today, Admiral Hasson commands an entire fleet of franchise luxury dive yacht opera- tions worldwide. To understand the pioneering nature of such a believer one must go back to the beginning, the first vision that such an idea might indeed be worth all the time, effort, energy, it will take to make that vision a reality. Always the difficult part, the measuring of dreams against the odds that it is not a vision, it is merely a dream. How do you find that out? You take this so very private baby of a dream and you expose it to the unbelievers, the naysayers. True, they never see your dream quite as you have, but they know all about it, why it won't work, why it is not practical, who could stake their life and reputation on such a thing? Nevertheless, you do, and have, and here and there, you find one believer, then two, men and women who will share their lives with you and your dream. Now is where the grit kicks in. Now you and your dream are responsible for others and it is not just you and your dream, families are a part of it, futures are a part of it, and actual lives are a part of your dream. This writer believes that this too is a part of being a pioneer. To consider the chances you are taking with everyone’s life as you build your dream into reality. Reality is different than dreaming. For reality you need others to come to your dream with their skills, they will change your dream, improve on your dream in ways you never thought about, with talents you do not have. There are the men who change continents, build nations, move societ- ies, and alter industries. Power, yes. Money, that too, but first comes the vision, then the commitment to the dream. 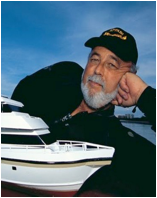 If you talk to Wayne, he will name many people who were a part of his life and who contributed to the success creating and building the Aggressor Fleet. While you may understand the collaborative effort of a modern world, also recognize it was the vision that inspired that effort in the beginning, organized it, and drove it forward inspiring acolytes along the way, many who found their home in that dream. 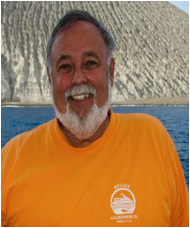 Wayne is no stranger to the awards stage at Beneath the Sea; he received his Diver of the Year award here for installing permanent moorings in all Agressor Fleet dive destinations.